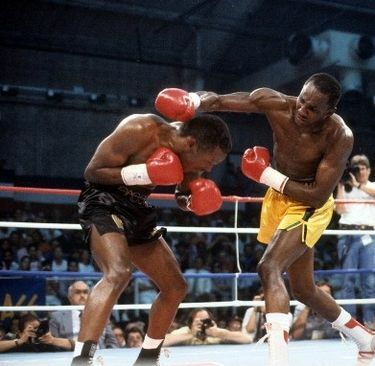 When Sugar Ray Leonard retired for the first time in 1982 it was a shock that left a huge vacuum in the sport. 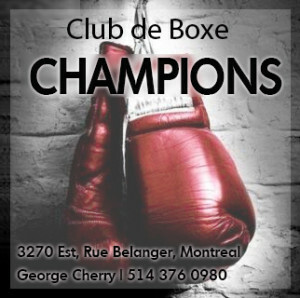 Over the next few years, the foursome of Thomas Hearns, Roberto Duran, Wilfred Benitez and Marvin Hagler compensated for the loss of boxing’s biggest attraction with a series of high-profile matches. But in the meantime, the search was underway for the next supremely talented fighter and marketable star to take Leonard’s place. Many thought he’d been found when Donald Curry established himself in 1985 as a dominant and undefeated welterweight champion of the world. Donald Curry was riding high in 1985. 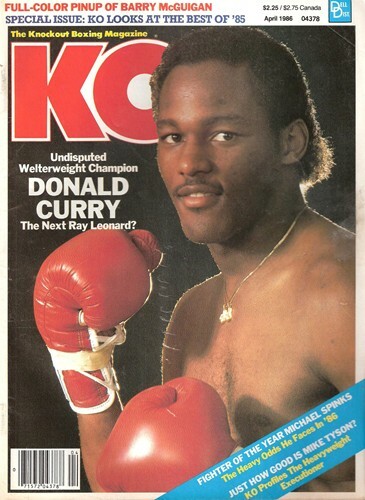 It’s easy to forget that at that time, Donald “The Cobra” Curry was widely viewed as Leonard’s natural successor, receiving as he did from many the appellation of the best boxer on the planet, pound-for-pound, superior even to Marvelous Marvin Hagler. 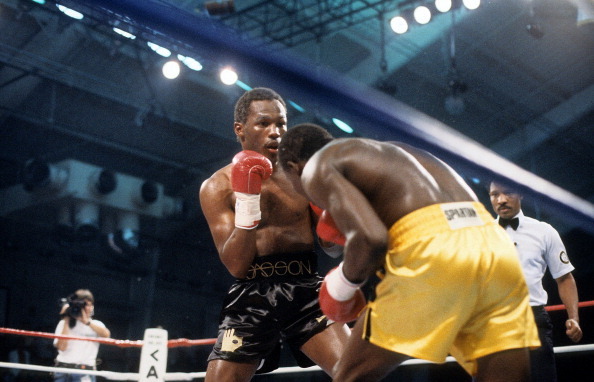 Having demolished the top fighters in the 147 pound weight class, including big wins over Roger Stafford, Marlon Starling, Colin Jones and Milton McCrory, Curry’s loss to Lloyd Honeyghan in 1986 was a massive upset, one of the biggest in boxing history. 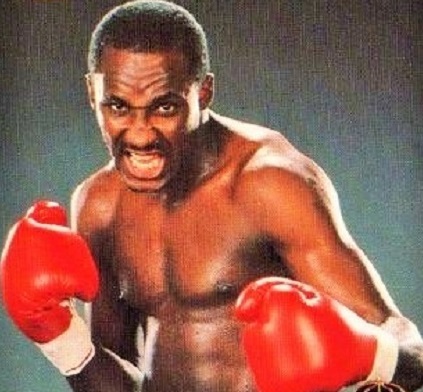 Meanwhile, Mike McCallum, aka “The Body Snatcher,” quietly worked his way up through the 154 pound weight class, winning the vacant WBA title from Sean Mannion in 1984 and defending it several times, most notably with impressive wins against Julian Jackson and McCrory. But no one at the time was touting McCallum as one of the very best in the sport, pound-for-pound. 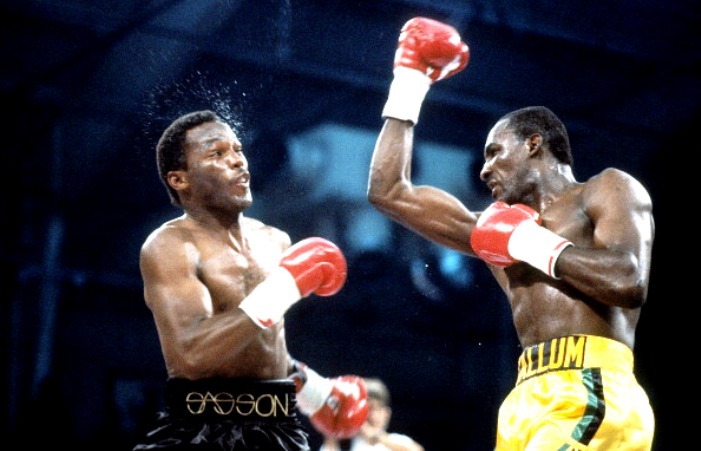 Following his first career defeat, Curry turned his back on both a rematch with Honeyghan and the welterweights, moved up to 154, and after a couple of tune-up wins, got a shot at McCallum’s title. McCallum vs Curry was an excellent match between two great talents, and a perfect crossroads fight, with both men’s careers on the line. The oddsmakers tabbed Curry as the 2 to 1 favorite. 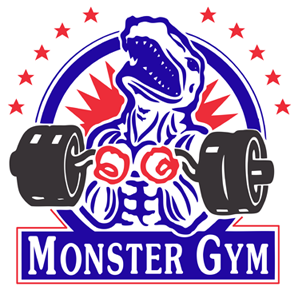 And, early on, it looked like “The Lone Star Cobra” had regained his form. Moving fluidly, throwing sharp, accurate punches, Curry controlled the action and landed the heavier blows. In particular, a cobra-quick right hand connected repeatedly in rounds two and three and put the champion on the defensive. After four rounds, despite a left eye that was swelling shut, Curry appeared in command. McCallum, while competitive, looked uncomfortable and bothered by Curry’s speed. Then came the unexpected. And one of the best one-punch knockouts in boxing history, as a minute into round five, Curry made a fatal mistake. Having thrown an ineffective combination, he backed away, but with his hands down, perhaps anticipating a body punch, but definitely not anticipating McCallum’s counter left hook, thrown with such velocity the momentum lifted McCallum off his feet. The blow landed perfectly, flush on Curry’s jaw, and sent him flat on his back, down and out. The crossroads confrontation was decided by a single punch and Curry would never be the same. Tough losses followed from Michael Nunn and Terry Norris, among others, before he finally retired. And that time when pundits and fans around the globe thought he was a sure bet to become an all-time great was quickly and conveniently forgotten. Meanwhile, McCallum would go on to fight for another ten years, establishing himself as one of the best of all time. And it was most unfair, both to him and to boxing, that none of the so-called “Four Kings” had the guts to take him on. Likely the devastating left hand which knocked Donald Curry out cold had something to do with their trepidation. Nice piece. McCallum is one of the most underappreciated fighters in history. Loved his first two fights with Toney. 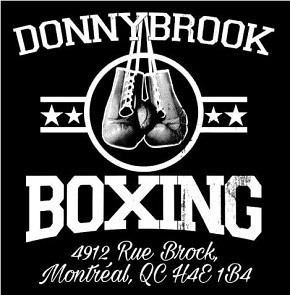 Talk about pure boxing! No doubt McCallum was a great boxer but it is unfair to say the Four Kings avoided him. By the time he had made a name for himself (basically after this win over Curry), the careers of both Hagler and Leonard were pretty much finished. Duran was already in his late 30’s and well past him prime. He could have possibly fought his former Kronk gym stablemate, Thomas Hearns, but even then Hearns quickly moved up to Super Middle around this time. Whether it was to avoid “The Body Snatcher” we’ll never know, but I doubt Manny Steward would have wanted to risk that fight. Unfortunately McCallum was just too high risk for a low reward.